TGIF! I hadn't planned to have a 3 day weekend, however an unexpected vet visit with an ill-feeling Sophie this morning has resulted in just. I'll spare you the less than desireable details... let's just say she's got some bacteria in her stool and is now on antibiotics and a probiotic supplement (as well as a bland diet of boiled hamburger and rice, though she thinks that's just grand). We'll know on Monday whether there's an underlying culprit or if she just picked this up like a cold. No worries... the Princess is currently ignoring Tut's annoying cries for her to move curled up sleeping next to me. 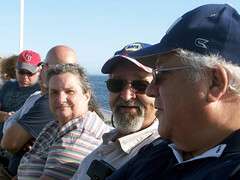 That's Dad in the middle between my Mom and Matt's Dad above, taken during a wonderful day at sea. 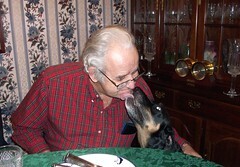 The kids all wonder if Grampy has any cookies in his pockets send lots of sloppy birthday kisses! 1. Johnny Weir is enjoying his life and does not deserve to be mocked or threatened for doing so. 2. I have been enjoying the 2010 Olympics. 3. And the day came when the risk to remain tight in a bud is amongst us once again. 4. Order your very own Lapdog Creations tee at Zazzle or Cafe Press if you get an urge. 5. Having sweet dreams makes for a restful night's sleep. 6. What does it take to be stressfree? 7. And as for the weekend, tonight I'm looking forward to a quiet evening at home with the family, tomorrow my plans include some more Ravelympic knitting and Sunday, I want to enjoy the day! Feel better soon, Sophie. We're all thinking about you. Happy birthday to your dad, and I hope Sophie feels better already! Thor wants to know if he can pretend to have Sophie's disease, and have burgers and rice, too! Seriously, I hope she's improving. And happy birthday to your Dad! Happy Birthday to the Lapdogs' Grandpa! He's a handsome dude! Hope Sophie is feeling better. Burger and rice is a favorite around here, too!